Composer and performer Juan Manuel Cañizares It will show this autumn fellowshipping his famed ability to classical music and flamenco intelligently, natural and instinctive. The artist whose curriculum stands out for having shared the stage with masters like Simon Rattle orchestras and carving Berlin Philharmonic– will debut in the Philharmonie de Paris It is 24 November with a concert that has already sold out. And it will, Besides, with his acclaimed Al-Andalus concert, "One of the most important events in the world of classical guitar from the world premiere of Aranjuez's concert”, in the words of Director Josep Pons. Before joining the capital gala as part of his tour of France, The artist will perform his Al Andalus a little (22 Y 23 of November). At the end of this month, Canizares also feature the world premiere (30 of November, 1 Y 2 from December) Of his work Mediterranean concert with the Barcelona Symphony Orchestra i Nacional de Catalunya (Obrc) and under the direction of Kazushi Ono Japanese master. The artist shows, in this way, creative and expressive moment of undoubted originality height and spanning. He Mediterranean concerto for guitar and orchestra by Joaquin Rodrigo memory He is dedicated to the author of Aranjuez's concert, Cañizares work with which maintains a special bond, because it was the who played with the Berlin Philharmonic and Simon Rattle. With this concert and an album that will include outstanding works for guitar Rodrigo, the interpreter wants to pay tribute to the master of the 20 anniversary of his death. On the other hand, he Concert 'Al-Andalus' for flamenco guitar and orchestra It premiered with great success in May 2016 at the Auditorio Nacional of Madrid and is dedicated to the memory of Paco de Lucia, Canizares personal friend for a decade. The work was commissioned by the National Orchestra and Choir of Spain, at its premiere, Canizares was wrapped by the OCNE own, under the direction of Maestro Josep Pons. "The audience thanked him with remarkable success", He wrote in his chronicle of the concert the renowned composer and critic Tomás Marco. In this composition, the artist reflected his ability to score his classical training and flamenco soul into a whole that makes his creations in a unique and heterogeneous way of making and understanding music. Guitarist and composer, Juan Manuel Cañizares is, definitely, one of the most important and influential flamenco artists worldwide, but it is equally comfortable with classical repertoire with his own compositions. With a career spanning more than four decades, Cañizares is the first and only flamenco guitarist invited by the Berlin Philharmonic. He has collaborated with leading orchestras in the world, among which the Staatskapelle Dresden, NHK Symphony Orchestra, City of Birmingham Symphony Orchestra, National Orchestra and Choir of Spain and OBC. 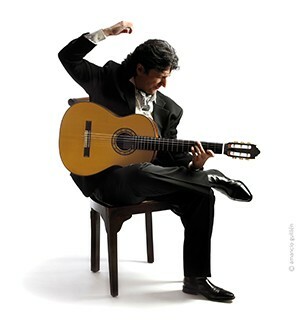 He has won the prestigious National Award for Guitar (1982), Music Award (2008) and Flamenco Hoy (2000, 2011 Y 2013). He had a close relationship with Paco de Lucia, as well as numerous artists from the likes of Enrique Morente, Island Shrimp, Serrat, Alejandro Sanz, John Paul Jones, Peter Gabriel, Mauricio Sotelo and Leo Brouwer, among others. Canizares catalog as a composer includes works for the National Ballet of Spain and soundtracks for films like Lola is going to ports (with Rocio Jurado and Paco Rabal), Flamenco (1996) Y Whom, Saura (2016), Carlos Saura. He has worked in more than one hundred albums and, as a solo artist, Has published 14 own records. Alongside his career as a performer, Canizares devotes much of his time to research and teaching flamenco. He teaches flamenco guitar at the prestigious Higher School of Music of Catalonia (ESMUC) since 2003 and gives numerous master classes in Spain and abroad. His recent and future engagements include outstanding participation in the opera The public, Mauricio Sotelo, at the Teatro Real in Madrid, and performances at the Palau de la Música Catalana, Milan Auditorium, International Festival of Music and Dance in Granada, Festivals Radio France Montpellier y La Folle Journée. Likewise, will offer the New Year's Concert in Dresden, will act with the Gulbenkian Orchestra in Lisbon, Orchester de Canarias, the Orchestra of Navarra, the Taipei Symphony Orchestra and the Córdoba Guitar Festival. He also undertake a tour of Russia with concerts Al Andalus Y Mediterranean. While the Canizares Flamenco Quartet will also perform in Palermo, China will rotate and will offer concerts at festivals guitar Montenegro, Denmark, Greece, Germany, etc.